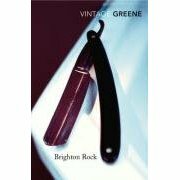 Brighton Rock by Graham Greene – It's Time to Read! A gang war is raging through the dark underworld of Brighton. Seventeen-year-old Pinkie, malign and ruthless, has killed a man. Believing he can escape retribution, he is unprepared for the courageous, life-embracing Ida Arnold. Greene’s gripping thriller, exposes a world of loneliness and fear, of life lived on the ‘dangerous edge of things’. I actually enjoyed this book. It was a slow read, and sometimes I got a little bored but overall it was exciting, with murder, fear, love and suspicion. The book shows a dark side of Brighton, with gang wars and dingy hide-outs. The ending was not what I expected either – and probably not how I would have written it, but a good way to end the book. I liked Ida best. Pinkie was too arrogant and moody for me – he had lots of mood swings, which although fitting for his character, did annoy me somewhat after a while. Ida on the other hand, she was big and brave. She was clever and determined – and not easily scared. I think she was the most courageous character in the book. Although written in the 1930s, this is a good crime novel, and just as exciting as modern-day thrillers. If you like suspense, and adventure, this book is worth reading.